To jump-start the careers of graduate students and postdocs in the fields of engineering, math and the physical sciences, Cornell University Library held a free workshop, “Research from Start to Publish,” Jan. 7–8. 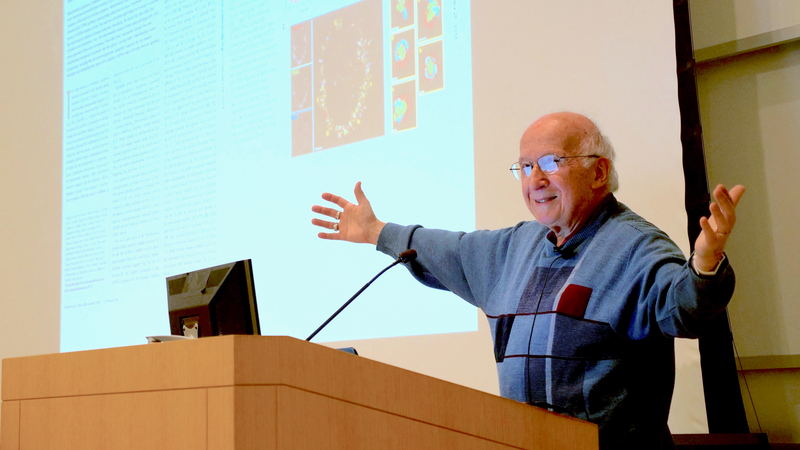 Nobel Prize-winning chemist Roald Hoffmann delivered the keynote lecture, sharing personal anecdotes and practical advice about scientific publishing, including understanding the submissions process, dealing with different editors, following guidelines, and addressing reviewers’ comments and questions. With humor, Hoffmann, the Frank H. T. Rhodes Professor of Humane Letters Emeritus, also underscored emotional factors influencing publishers. After Hoffmann’s lecture, participants heard from a faculty panel of journal editors: Shane Henderson, director of the School of Operations Research and Information Engineering; Matt Miller, professor in the Sibley School of Mechanical and Aerospace Engineering; and Anil Nerode, the Goldwin Smith Professor of Mathematics. The panelists shared thoughts on topics such as avoiding common mistakes, improving conference presentations and increasing chances for publication. Part of a series of immersive library workshops, “Research from Start to Publish” was organized by the Cornell’s science and technology libraries, and it drew 50 participants from 14 departments, including applied and engineering physics, materials science and chemistry. Yikun Zhao, a visiting researcher in biological and environmental engineering, hopes to apply what she learned from the workshop to her teaching and research at South China Agricultural University. “It was a very precious experience,” she said.